The ones who work hard deserve to have more than the ones who don’t. And it’s ok that a few of us have quite a bit more than others; that’s the incentive to strive for the “American Dream”. Yet, people say that the wealth must be distributed in such a way, that everyone can make a living and sustain a healthy life for themselves and their families. So who do we find lurking among the richest 1%? Well, to name a few, we’ve got the Walton Family of Wal-Mart, Jeff Bezos of Amazon, Bill Gates of Microsoft, as well as many dot com founders, the owners of food corporations like Mars, the Koch Brothers (oil and gas) and quite a few investment and hedge-fund bankers. Using statistics is a great way to create awareness, but it shouldn’t just amount to a shoulder shrug and depressed thoughts of what a terrible, unfair world we live in. It needs to do more than that. Don’t use it to get mad and blame the branches of government for not doing the “right thing” either. Instead, use it as inspiration to make a personal change. Ask yourself; what can I do to help correct this injustice? There are actually a few easy things you can do and start doing right now! What does it mean to shop small? Essentially what it means is to make your purchases at locally owned shops and eat at local eateries. That’s your neighborhood coffee shop, the mom and pop down the street, the farmers market, the vintage shop. When you shop small instead of shopping big (at for example Wal-Mart, Target, Gap or Macy’s), you are supporting a tax-paying, local businessman or woman, not a multi-billion-dollar corporation. 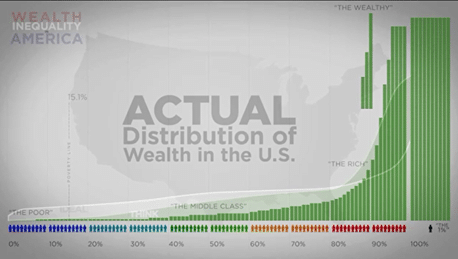 In order words, you are spreading the riches more evenly across the board, and pumping money into your local economy. 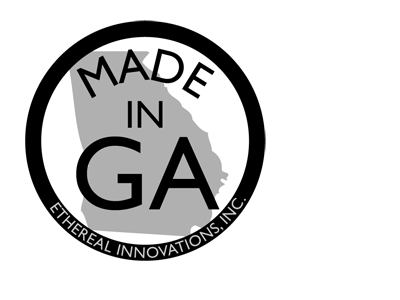 When you support locally-made, you are encouraging businesses to bring manufacturing back to where you live (from far away). Manufacturing jobs can make a big difference, as they are an important part in supplying the large lower and middle-class with stabile, safe, above-minimum-income jobs. 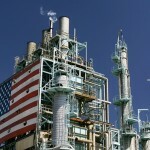 The more we manufacture here – the more people we can employ. In order to make themselves richer, the billionaire owners and CEOs of large companies generally outsource all manufacturing of products to Asia, never admitting that by doing so, they’re deliberately making their home country poorer. In the long run, making a country poorer means that the masses have to keep relying on “cheap” imported goods, as that’s all they can afford, allowing the corporations to keep importing since (obviously) that’s what the “people want”. See that vicious circle? In short, it’s terrible for our economy and our people and it keeps the 1% way ahead of the rest. (As for the people overseas manufacturing these items as “cheaply as possible”, it’s not good for them either. If nobody stands up and stops supporting the businesses they un-ethically produce for, they have no hope for better working conditions.) Buying local does make a difference. Every time you shop on your credit card for such high amounts that you cannot afford to pay it off the next month and instead end up paying interest, you are making the top 1% richer. The banks and their investors use that money to make themselves another not-so-hard-earned buck. I’m not saying not to have a mortgage, a car or replace your broken dishwasher, I’m just saying; don’t buy another Chinese-made Coach purse on your credit card. It’s not that hard is it? We all have the power to make a positive change. Be smart and go local. 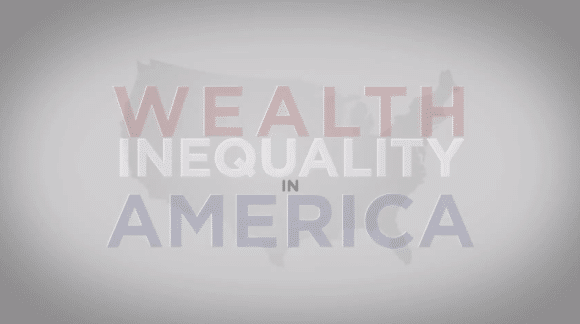 You can watch a short and detailed video about the wealth inequality in America below. 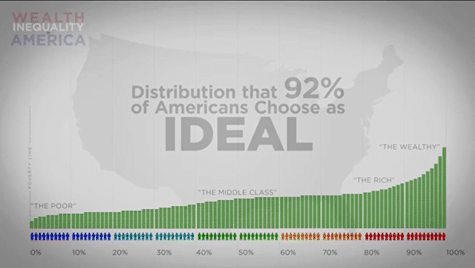 If you are one of the 1% and you’re reading this – great! I’m happy to see that you’ve found The Made in America Movement, and obviously have taken an interest in bettering our economy, conscious consumption and ethical fashion; that’s really unusual for your kind. We have a lot of ideas we’d love to discuss with you. Leave us a comment and let’s get in touch! When I am not writing or talking about sustainability (which does take up quite a bit of my time), I enjoy watching shows, good conversation, Riesling, reading articles and cooking. (Right now I am exploring some new vegan recipes, which I have yet to master.) My husband and I also enjoy the outdoors; hiking, camping and occasionally getting “lost” somewhere without cell reception. We live in Houston, Texas and work 8-5, in jobs we (mostly) enjoy. We’re definitely two of the lucky ones. Added to this I’ve also wondered about a “bought to last” movement. Have goals to buy better quality goods, spend a little more now, save in the long run, and FAR less waste. For example, Imagine if you bought one pair of great sneakers that eventually are worn out and tossed, but in the same time span that pair lasted, the similar cheapo shoes were replaced 4 times. All more fiscal waste and more actual garbage. Now times how many people in the town, state, and nation? All our cheap purchases: appliances, clothes, toys, even cars: are they really worth it for how often they are replaced? And more garbage made? The people of this country created the inequity of wealth by shopping at these stores and overextending themselves on credit cards. They are not victims – that’s a bad mentality to have. I believe in the shop small movement, but don’t blame the rich for the inequity – blame the masses. We see it everyday in the stores.